Oreo is now offering a custom phone ring as their on pack promo gift! Simply purchase a packet of Oreo biscuits and the custom phone ring stent is yours. Hurry up and grab one of this on pack promo before they run out of stock! This Oreo custom phone ring stent is a really useful mobile phone accessory. It is applicable to all mobile phones and tablets. This promo item can be repeatedly used, removed and can easily customized. In this case producers used the shape of the well-known Oreo cookie. Why we think this custom phone ring is effective product for Oreo promo campaign. Enhance Brand Awareness. This promo gift is good for all mobile phone users. The idea and initial product is a fairly new concept for the mobile phone accessories market; especially in Asia, so why not make it popular for all markets. Also with these well enjoyed and famous cookies, it makes Oreo as a brand easily recognized. Unique Design. Oreo is a worldwide favorable brand of cookies, as a result everyone will like to have this marketing gift. 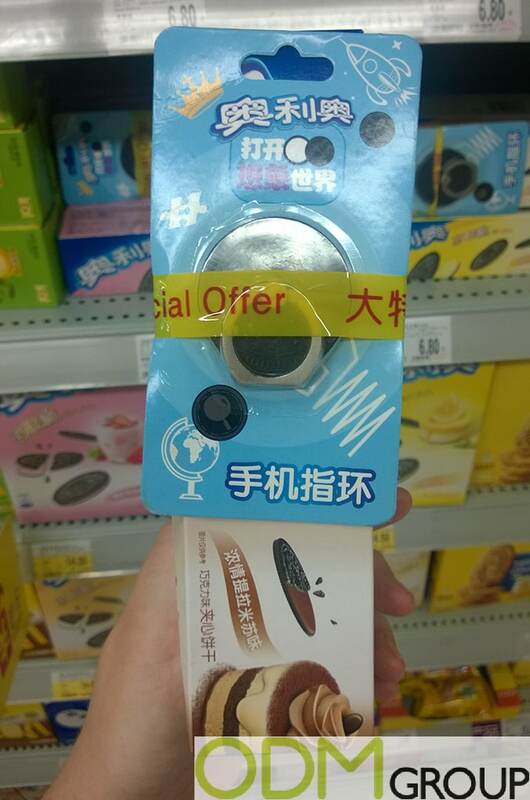 Offering this cool looking mobile phone ring Oreo producers can encourage customers to make impulsive purchases. Practicality. Customers can use this on pack promo gift, in order to prevent their phone falling out of their hands. Also they will have opportunity to use it as a stand for their phone. In this case using mobile phones or tablets to view some videos will be more convenient. This variety of promo product will also increase Oreo’s brand visibility and make the brand more important. Greater Revenues. Brand recall allows customers to recall your brand and your products. When your customer remembers your brand, it will encourage them to make repeated purchases. That’s why this Oreo promotion idea will definitely bring in greater sales. If you want to get success as Oreo producers, contact us today and we will assist you for your next promotional campaign. Here at ODM we have a huge sourcing, designing and manufacturing experience you can make it sure by yourself.